People can check whether their in-home Wi-Fi is giving them the best service by using a simple, powerful app launched by Ofcom today. The Ofcom Wi-Fi Checker, which runs on smartphones and tablets, allows consumers and businesses to discover the quality of their wireless internet signal wherever they live or work - as well as offering practical steps to help people get the best from their connection. It could be down to something as simple as interference from other electronic devices, such as a microwave oven, baby monitor, a lamp - or even Christmas fairy lights. The app tests the Wi-Fi set-up and, if it finds a problem, will provide some troubleshooting tips to help improve broadband. It is free to download now from Apple’s App Store and Google Play. The new app is being launched alongside Ofcom’s Connected Nations 2015 report - the most authoritative, in-depth look at the telecoms and wireless networks of the UK and its nations. This year’s report shows good progress on the availability and take-up of communications services, which are now crucial in people’s personal and working lives. Superfast broadband is now available to over eight in ten UK homes (83%, almost 24 million), up from 75% last year. This has partly been driven by BT rolling out its fibre network, Virgin Media converting more homes to faster packages, and the Government’s on-going Broadband Delivery UK programme extending superfast into areas not covered by the commercial market. However, Ofcom has identified challenges in improving coverage across the UK. 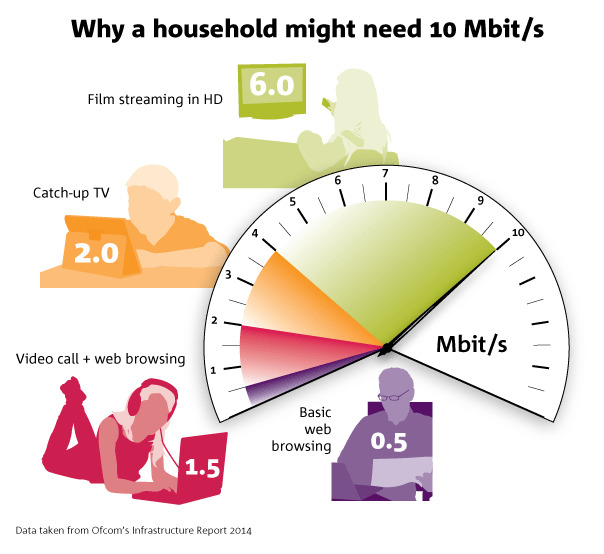 Around 8% of UK homes - around 2.4 million - are currently unable to receive broadband speeds of 10 Mbit/s or above. This jumps to around half (48%, or 1.5 million) in rural areas, where speeds are often affected by premises lying further from the network’s local street cabinet or local telephone exchange. Superfast services are now available to the premises of almost seven-in-ten small and medium sized enterprises or SMEs (68%, almost 900,000) - up from 56% in 2014. Looking further ahead, industry and policy makers are considering what networks are needed to support the next generation of superfast services. Today’s report finds ‘ultrafast’ broadband, which Ofcom defines as a speed greater than 300Mbit/s, is available to 2% of properties - some 500,000 homes. However, Ofcom’s Connected Nations report shows there is more work to be done on mobile coverage and quality of service. All coverage numbers relate to headline speeds, rather than actual averages. Research commissioned by Ofcom shows that users in these lower-speed premises were much more likely to score their broadband experience as less good than those with superfast connections. Ofcom’s Mobile Coverage Checker is available to anyone wishing to check where reliable coverage is likely to be available, whatever type of handset is used. It now includes better colour-coding for users with a vision deficiency; and, improved descriptions for voice, 3G and 4G services. Ofcom’s Wi-Fi Checker app will work on most smartphones and tablets and is free to download now from Apple’s App Store and Google Play. Just search for ‘Wi-Fi Checker’ or ‘Ofcom’. Ofcom’s Connected Nations Report was previously known as the Infrastructure Report. Ofcom has released much of the data from the Connected Nations report as open data, including fixed broadband speeds at postcode level. Any questions about this data should be sent to open.data@ofcom.org.uk. People can check whether their in-home Wi-Fi is giving them the best service using a simple, powerful ‘app’ launched by Ofcom today.